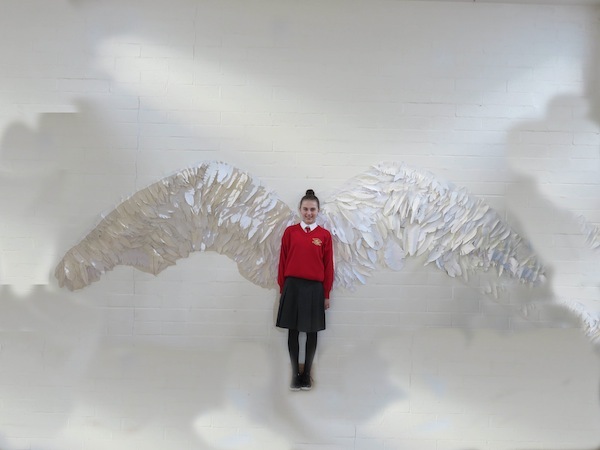 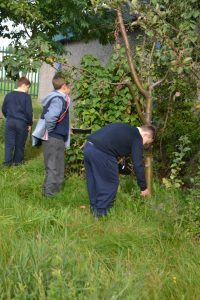 Changes in the School Grounds from September to November, Loreto, Crumlin. ” It was like they were discoverers and explorers. 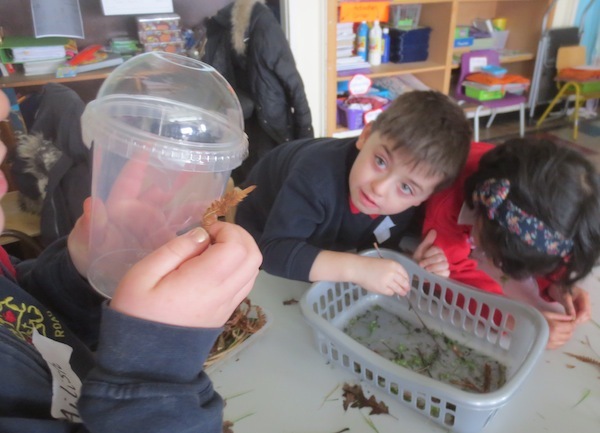 They were always noticing things and coming back with new information.” Ms. Colgan. 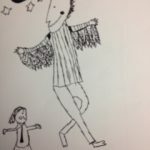 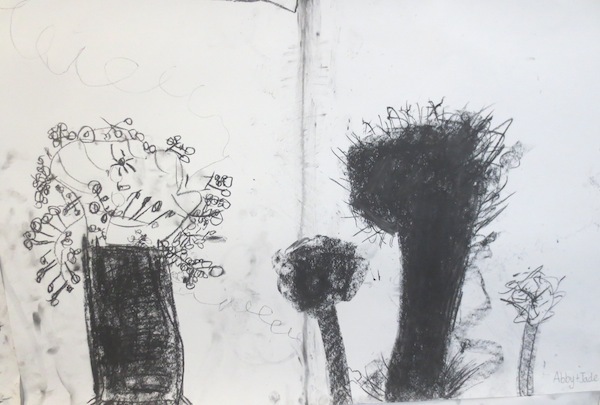 About drawing – “I loved the charcoal; it was very messy.” Robin and Emma. 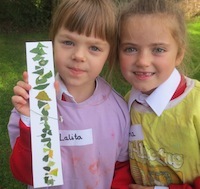 We spent our first session in the school grounds looking at all the shades and hues of green. 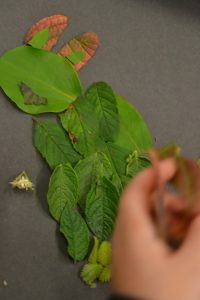 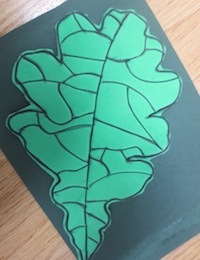 In pairs the children collected greens by sticking them to card with double- sided tape. 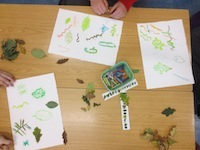 We looked at pattern in the leaves, observing the veins and the patterns of the edges. 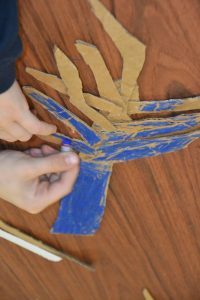 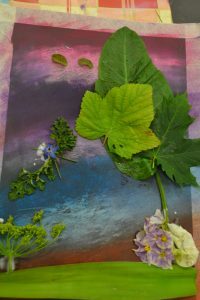 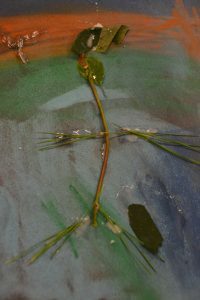 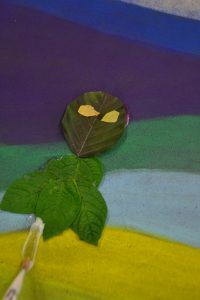 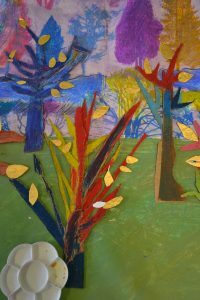 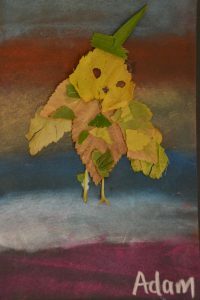 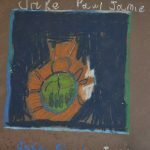 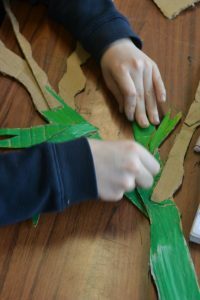 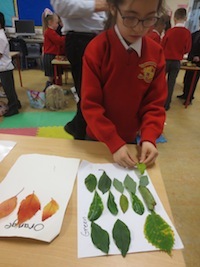 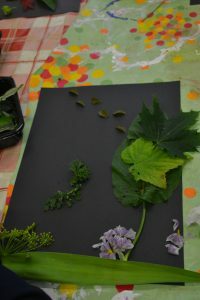 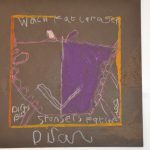 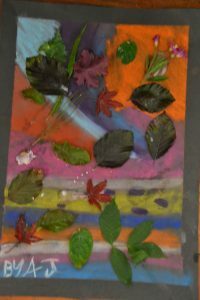 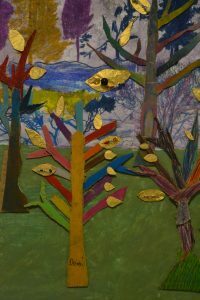 The children collected leaves that they found interesting and made drawings of the patterns in oil pastel back in the classroom. 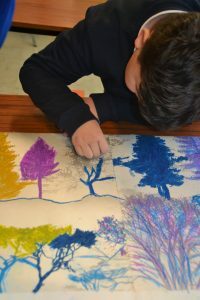 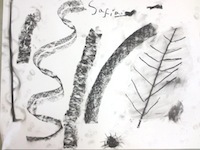 Some made invisible patterns by drawing with white candle wax and white oil pastels. 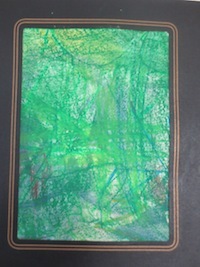 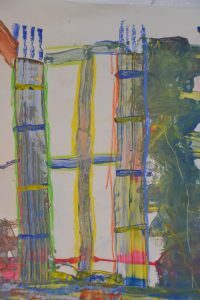 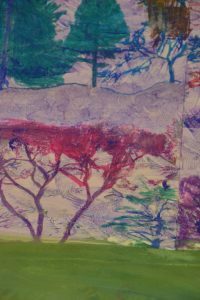 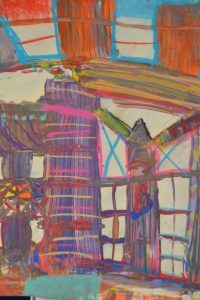 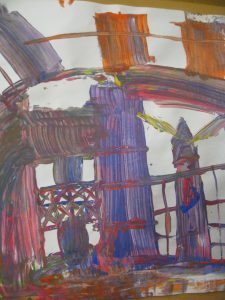 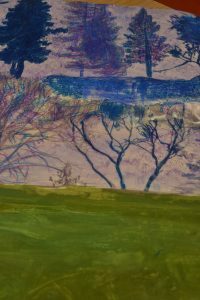 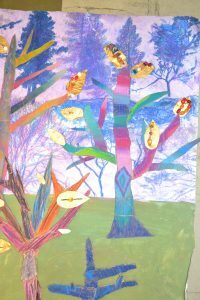 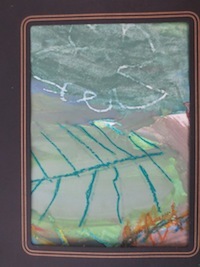 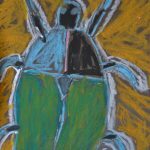 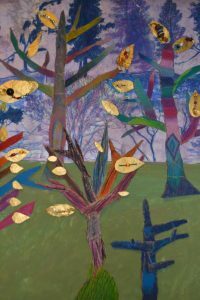 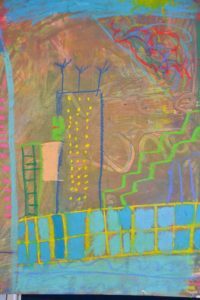 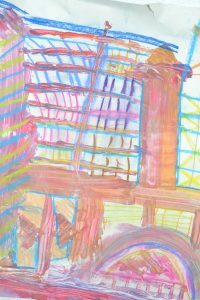 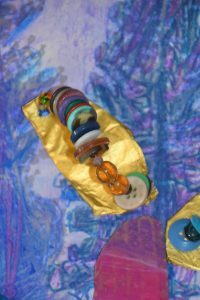 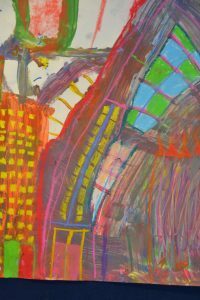 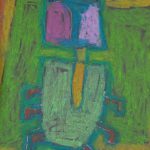 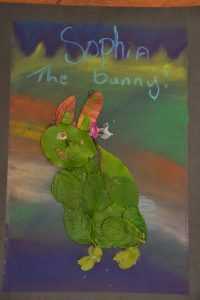 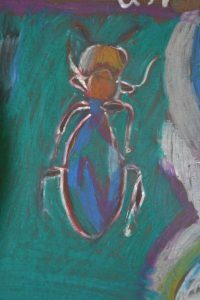 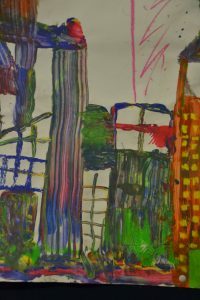 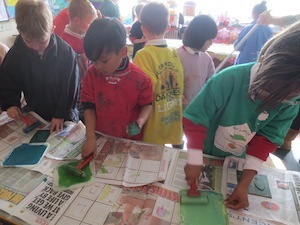 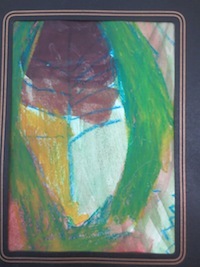 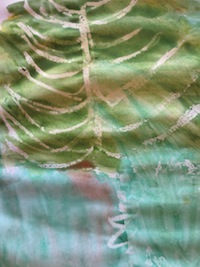 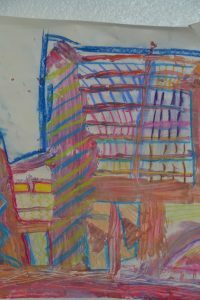 The children mixed many shades and hues of green and painted over their pastel patterns. 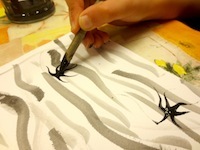 The invisible patterns appeared as they painted over them. 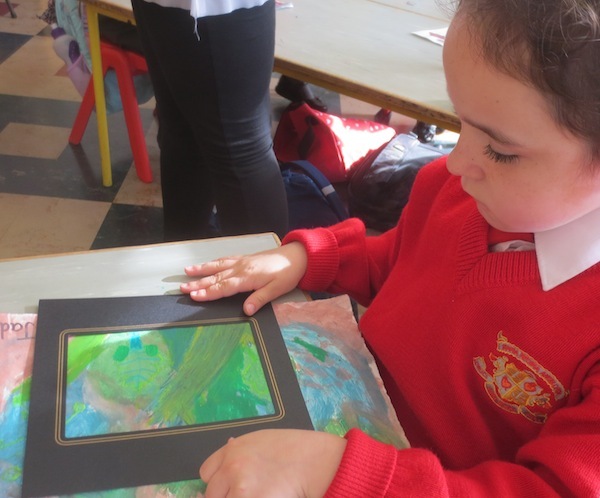 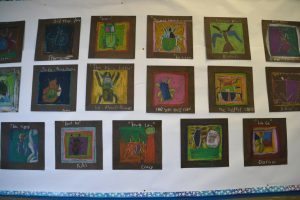 Using frames the children chose their favourite part of their paintings. 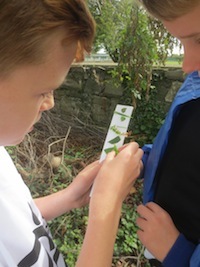 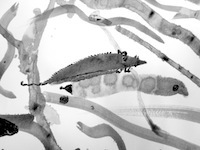 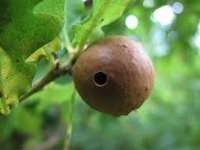 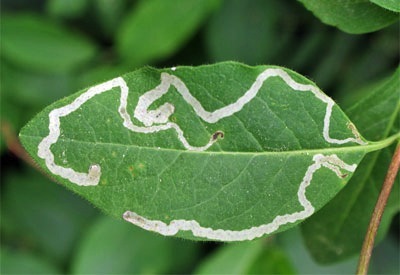 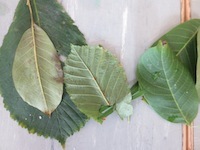 There were many new things to find out through our observations, such as gall wasps and leaf miners. 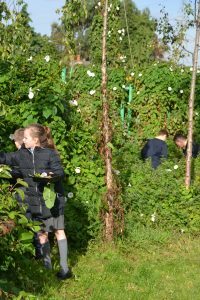 Having explored the school gardens the children had developed an interest and curiosity about plants. 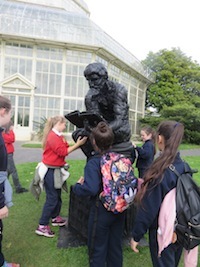 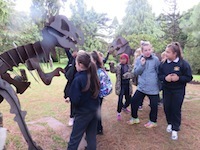 During our trip we looked at the plants and the sculptures. 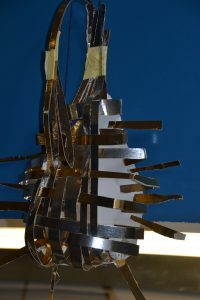 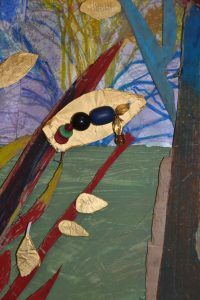 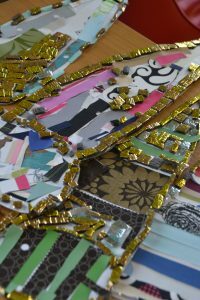 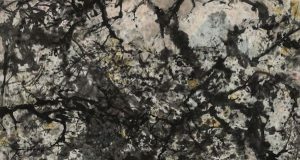 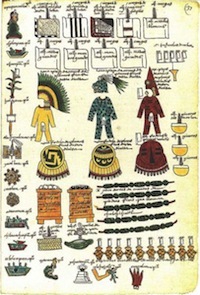 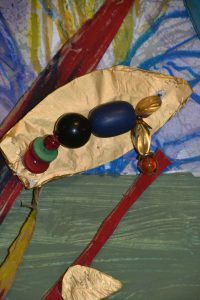 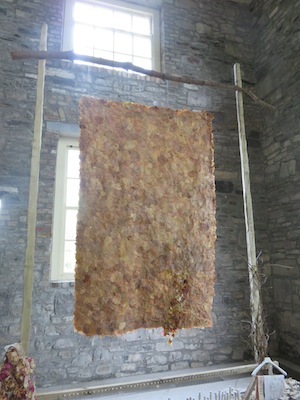 The artists used lots of different materials both natural and man-made. 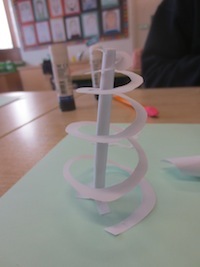 Some of the sculpture gave us ideas for our work. 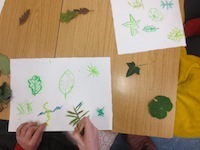 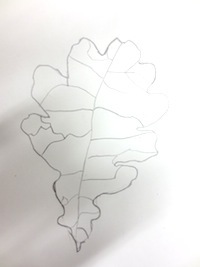 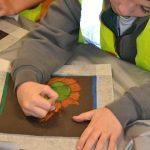 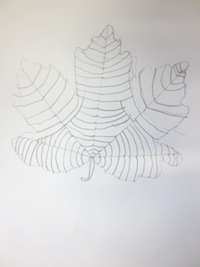 The children made very detailed drawings of leaves and then drew them on to foam with pens to incise the lines into the surface. 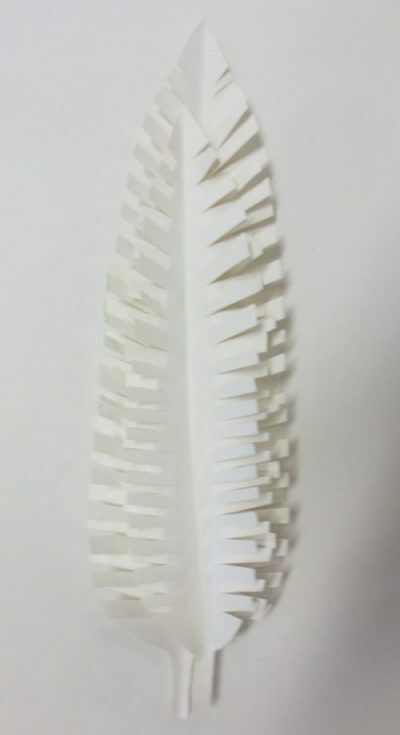 They glued these to card. 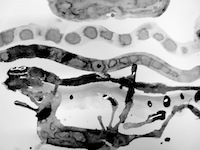 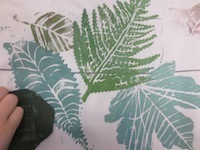 These were then used as printing blocks. 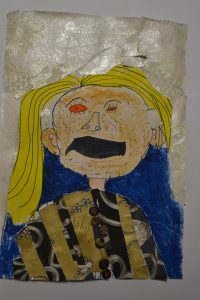 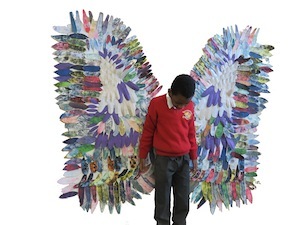 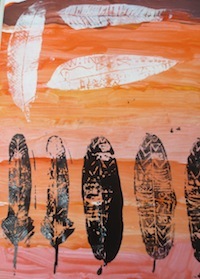 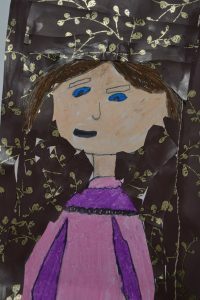 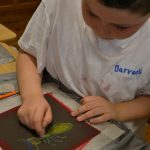 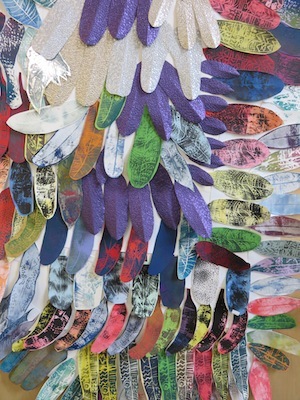 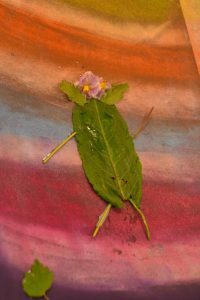 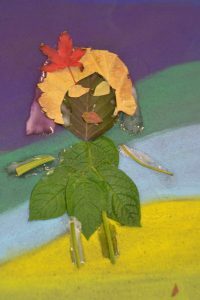 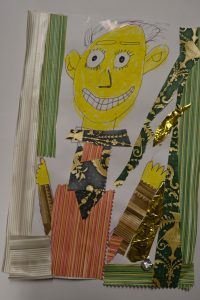 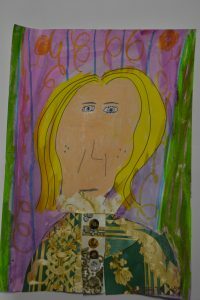 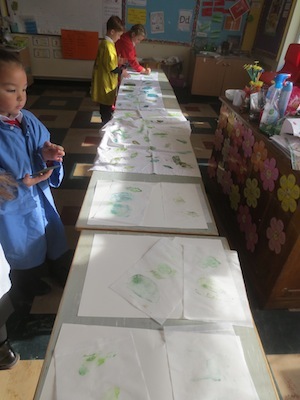 The children printed onto different surfaces, paper, and fabrics. 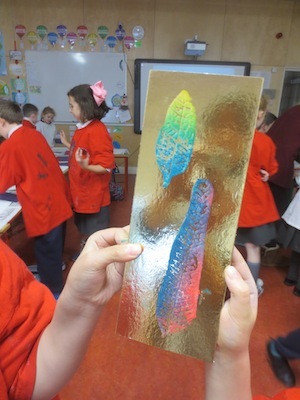 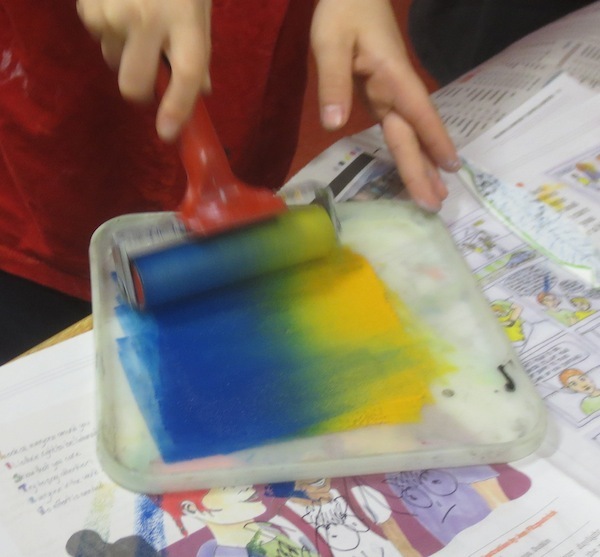 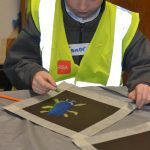 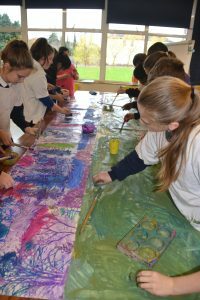 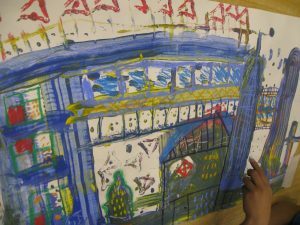 Initially they were reluctant to overlap their prints but once they started they really enjoyed seeing colours coming through their prints. 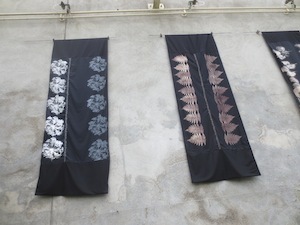 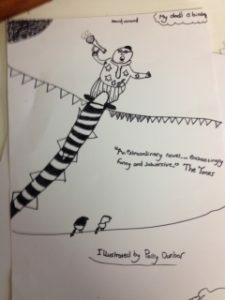 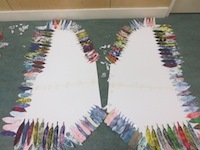 These were made into bunting and banners for the classrooms. 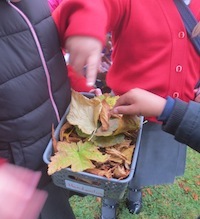 We went back out into the school grounds to look at the colours and gather leaves. 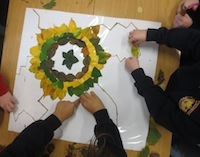 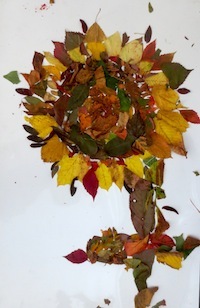 Beforehand we had a look at the leaf work of the artist Andy Goldsworthy. 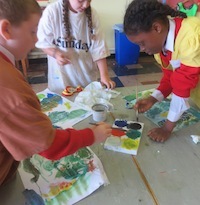 The children worked together in their class groups. 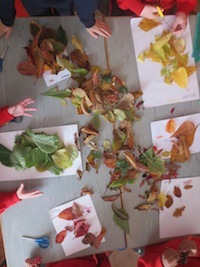 First they sorted the leaves into colours. 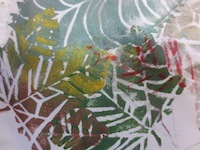 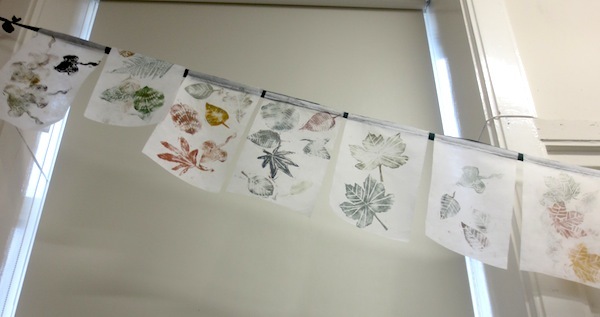 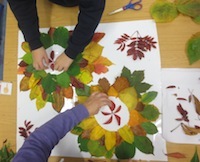 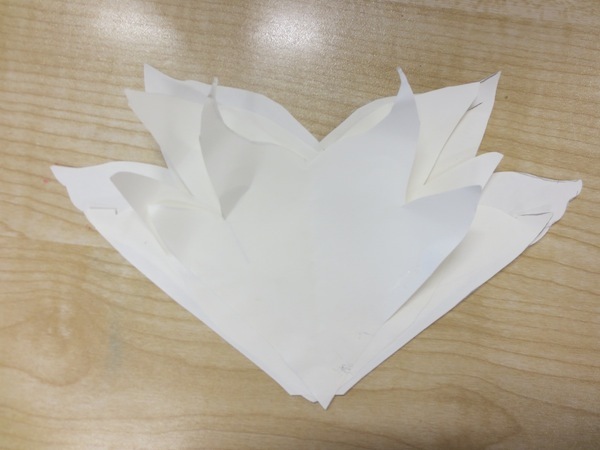 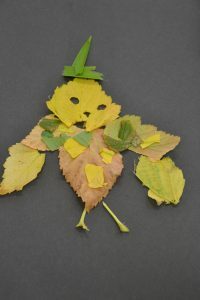 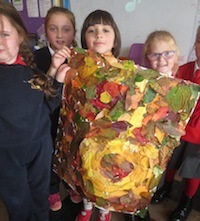 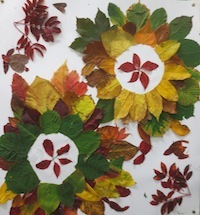 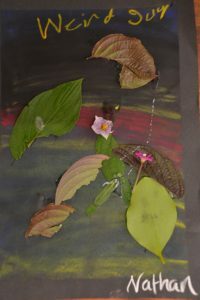 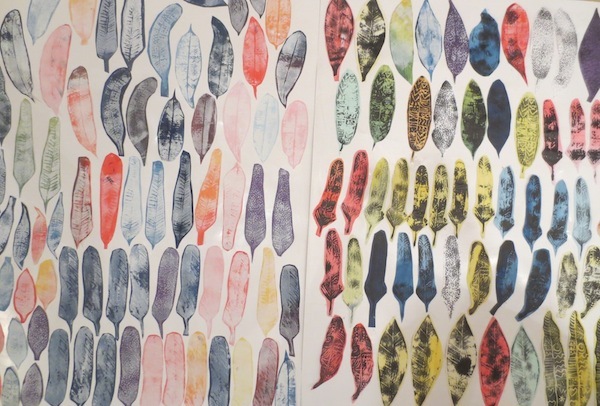 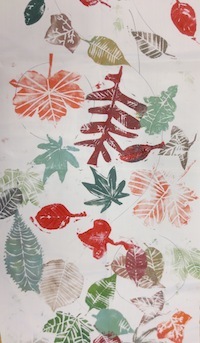 Then using contact paper they created these leaf artworks. 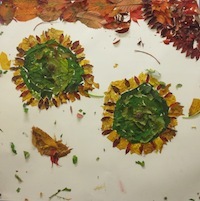 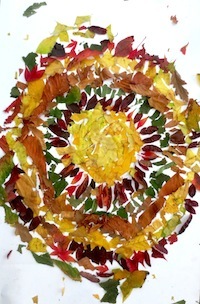 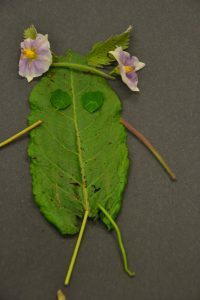 They laid paper plates on to the contact to create circular patterns and then lifted them once they made a circle with the leaves. 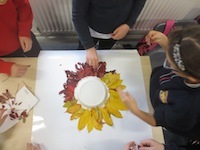 All the groups worked well together listening to each others’ suggestions. 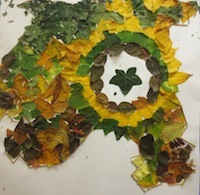 Circle patterns turned into images of sunglasses, Pooh Bears head, flowers, suns and a deer who then disappeared in the pattern making. 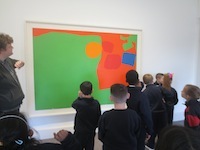 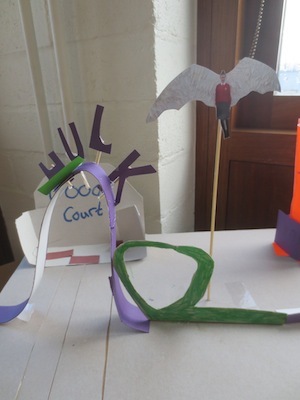 We had a look at the work of the American sculptor Alexander Calder. 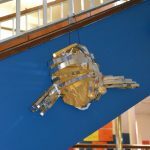 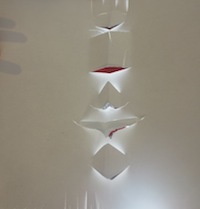 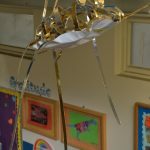 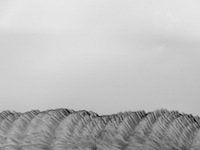 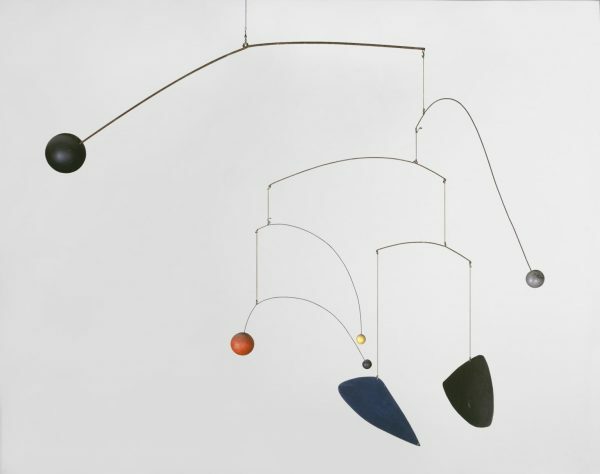 He is known as the originator of the mobile, a type of moving sculpture made with delicately balanced or suspended shapes that move in response to touch or air currents. 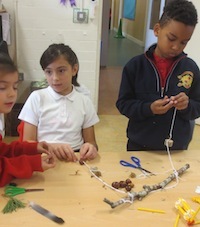 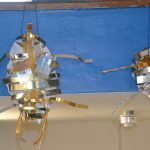 The children first learned to tie some knots so they could make their own mobiles. 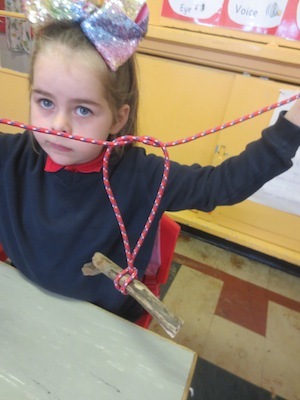 They learned the Larks Foot and the Square Knot. 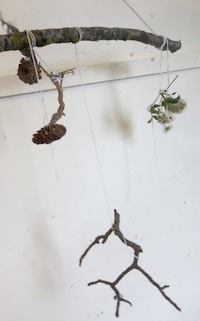 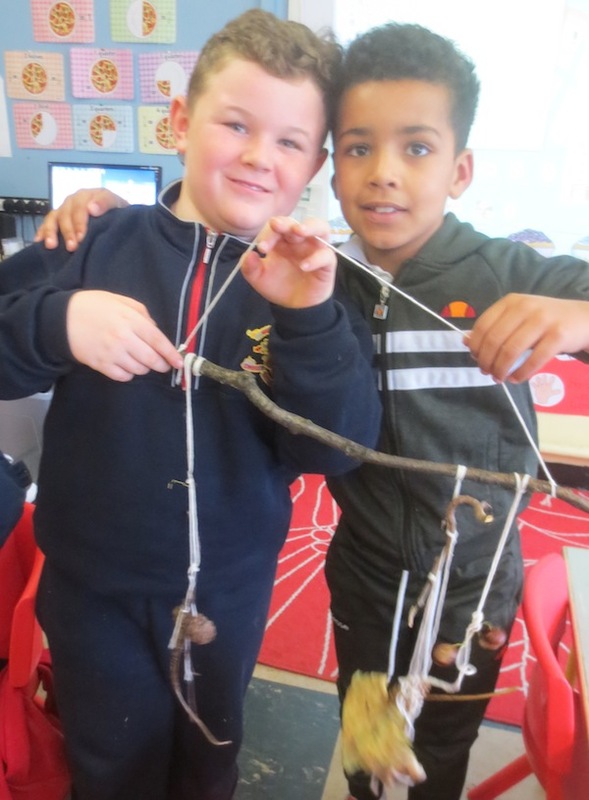 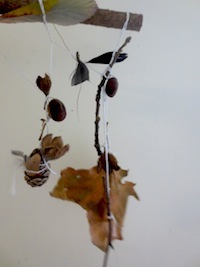 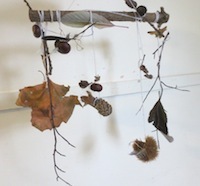 Then, working in pairs and using natural objects they made mobiles. 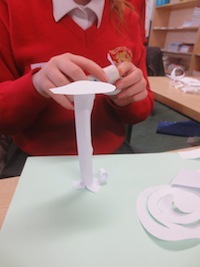 There was a lot of discussion of weight and balance. 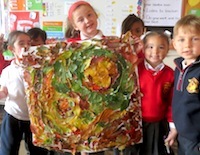 This very pleased pair declared that it was the best work they have ever made. 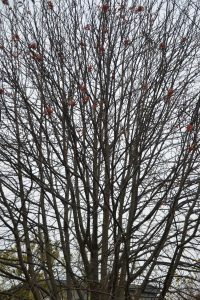 The Trees Rest for the Winter. 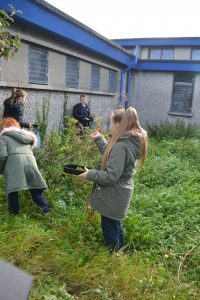 For our final session in November, after a week off for Halloween, we went back out to look at the garden. 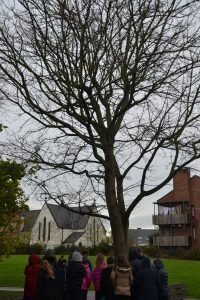 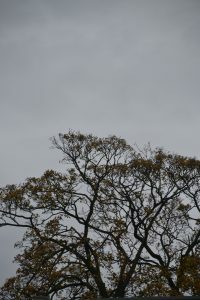 Some trees had no leaves and others had some still hanging on. 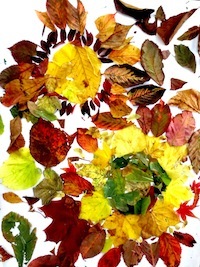 It is their time to rest until Spring. 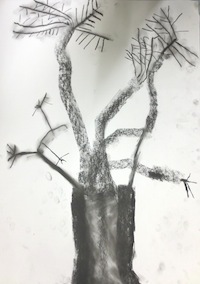 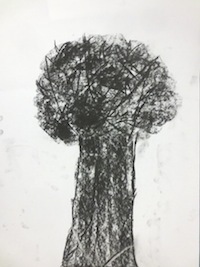 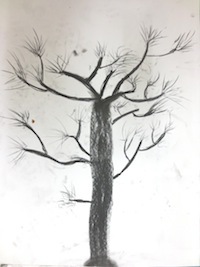 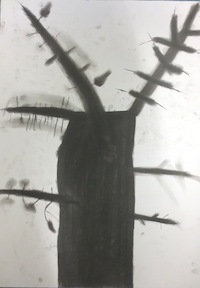 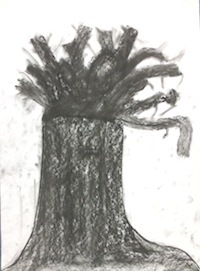 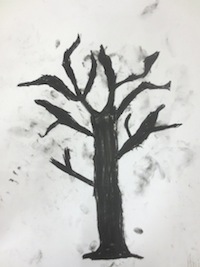 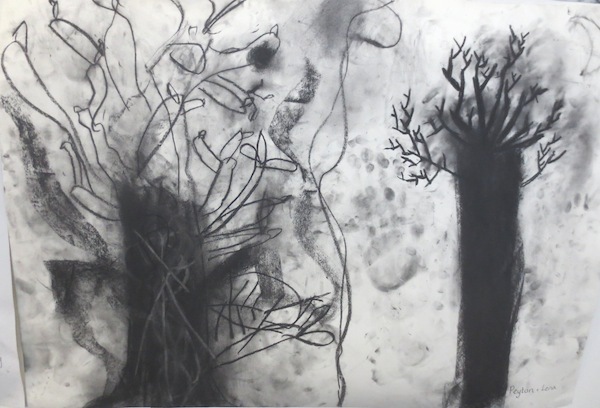 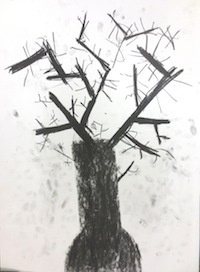 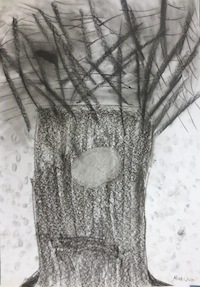 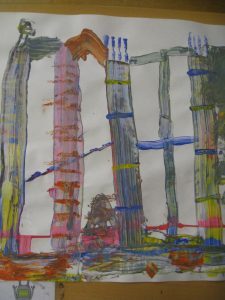 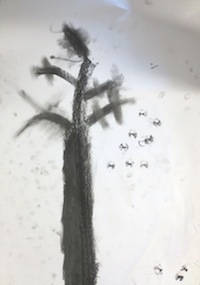 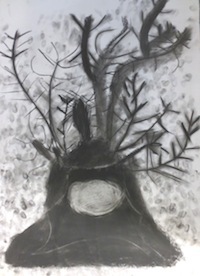 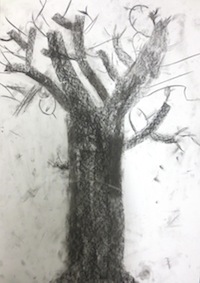 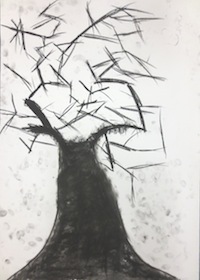 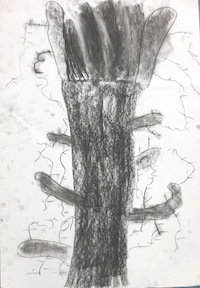 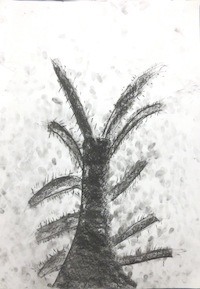 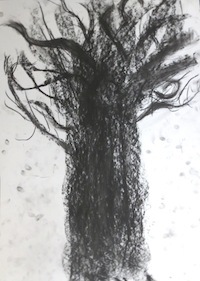 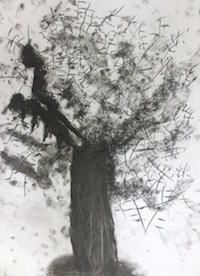 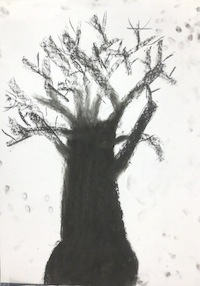 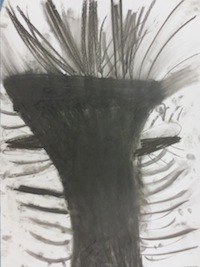 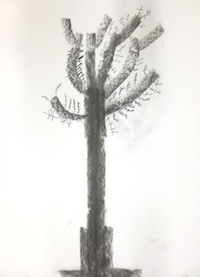 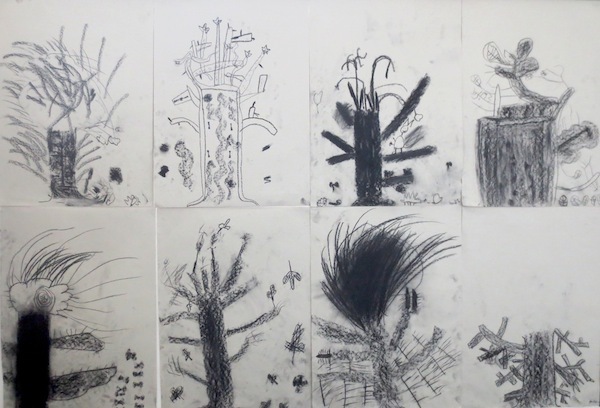 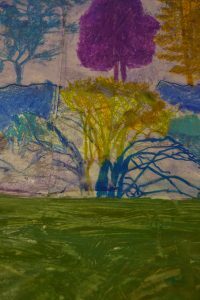 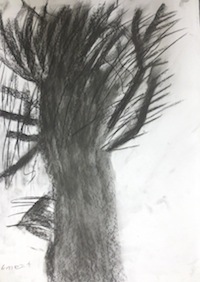 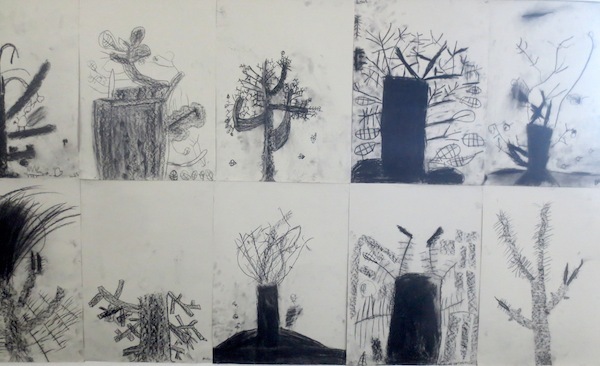 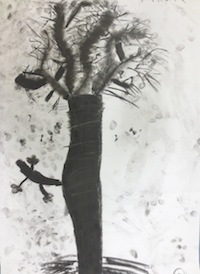 I decided that it would be good to use charcoal to make drawings of the trees so before we went out to the garden the children explored making marks with charcoal and rubbers. 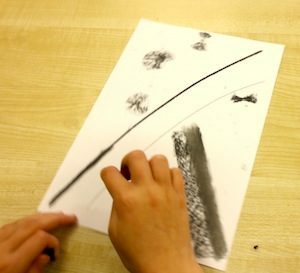 They kept reworking on the marks they made – “It looks like………” We discussed what textures, lines and shapes they made. 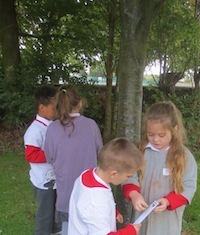 Out at the trees we looked at the tree trunks and the texture of the bark. 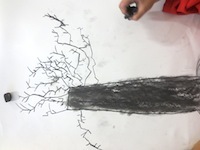 We wondered how far the roots went under the earth. 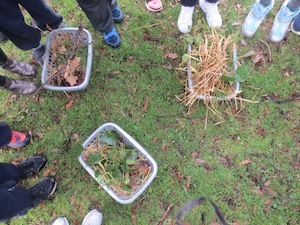 We looked at the branches and how they became smaller and smaller. 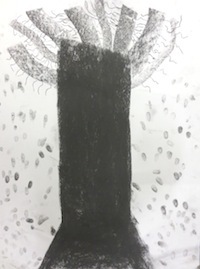 Back in the classroom the children looked at their charcoal marks and were asked what marks would they use to draw their tree. 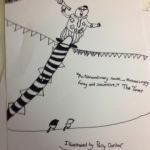 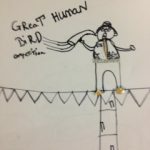 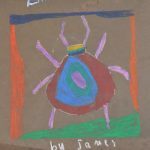 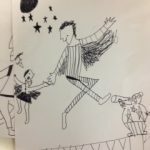 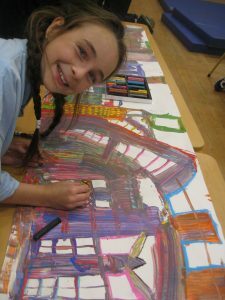 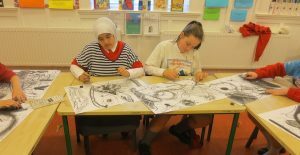 I loved the way they grappled with their skills and ideas and each came up with very different and very beautiful drawings. 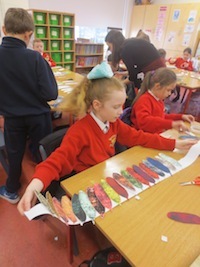 I began working with this lovely first class of 20 children on the 6th February. 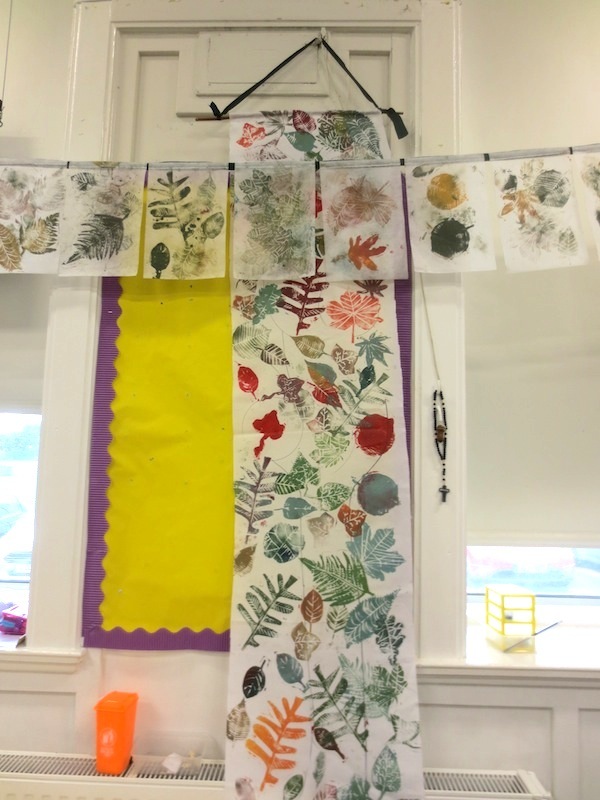 The teacher suggested we have Spring as our theme. 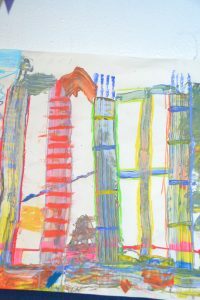 She was also interested in construction. 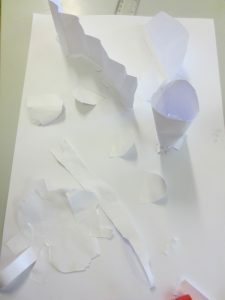 I decided that we would spend the first 3 sessions exploring construction with paper and card before introducing our theme. 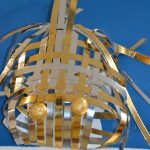 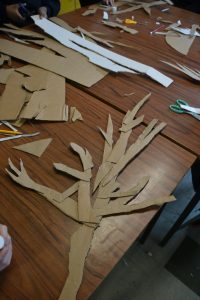 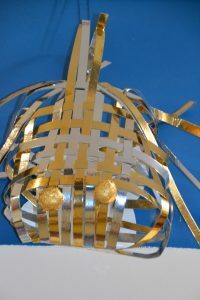 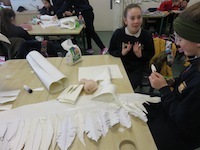 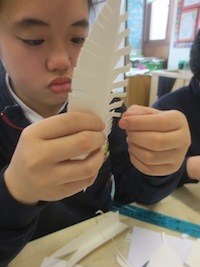 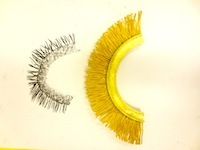 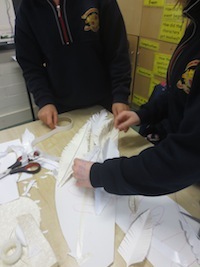 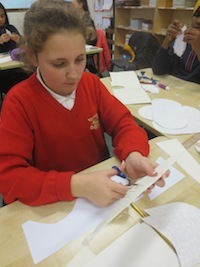 We began with paper, trying our different techniques, cutting, tearing, curling, folding, scoring, pleating, rolling. 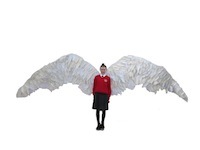 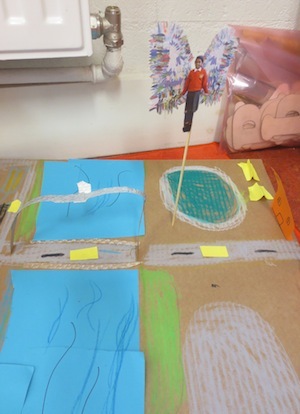 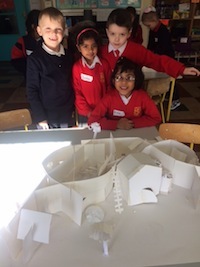 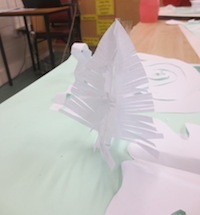 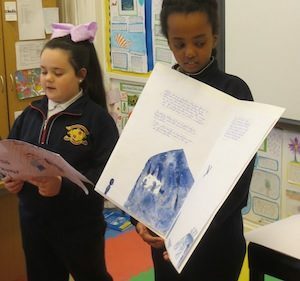 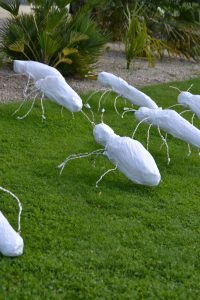 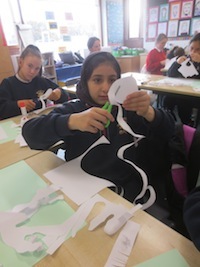 The children began to see miniature worlds when they stuck their paper constructions on to a sheet of paper. 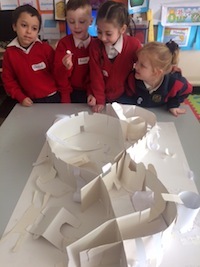 The enjoyed telling each other about their worlds so the following weeks I decided to introduce card to their materials and encouraged them to work in groups. 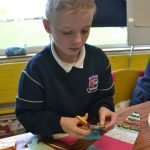 Each child was given a long rectangle of card with slots in both sides and asked to join up with other people in their group. 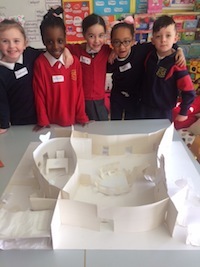 They were very excited as they created ‘rooms’. 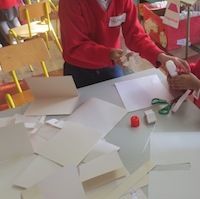 I showed them some more techniques that would be useful when they are working in card. 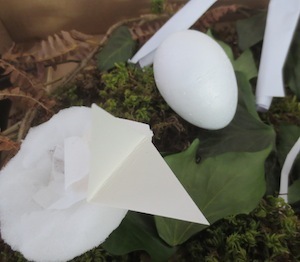 The also used paper for these worlds. 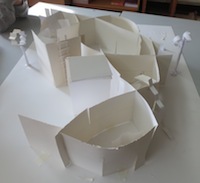 Part of the idea was to decide which material worked best for their construction. 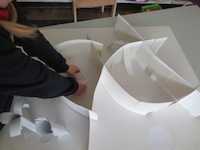 The following week they continued on their construction. 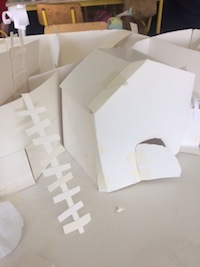 Adding lots of details such as doors, windows, ladders and fences. 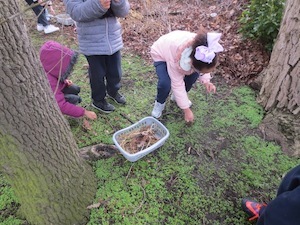 Our next session was on the 6th March – Spring was in the air. 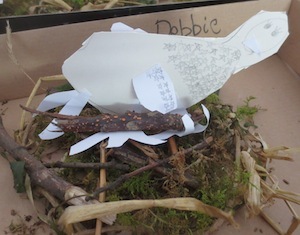 We talked about what birds the children see in the school grounds. 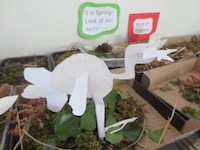 They had done a lot about birds with Ms. Doyle so they were very aware about the bird life in the school grounds. 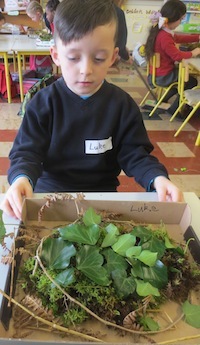 We looked at photographs of nests. 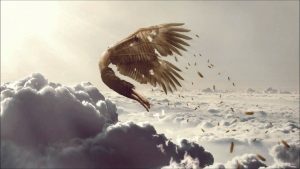 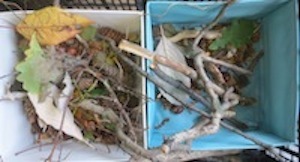 Different birds make different nests. 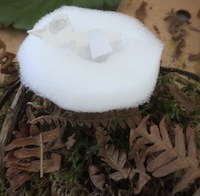 They noticed that a lot of nests are soft in the inside. 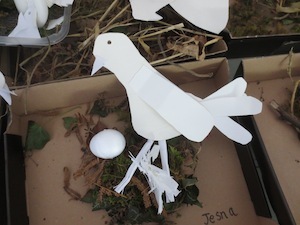 The children went quietly out to the garden and we saw lots of birds, a thrush, a blackbird and some crows. 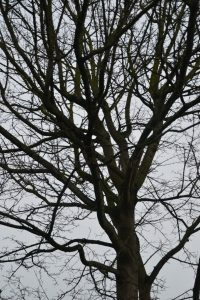 The crows were building nests in the tall trees. 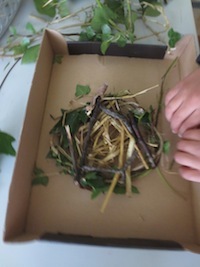 The children pretended to be birds and collected materials to make nests by only using two fingers and a thumb just like a beak. 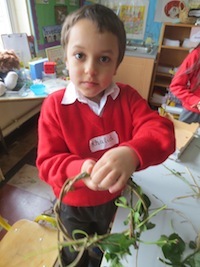 Back in the classroom each child wove a circle using ivy as a structure for their nest. 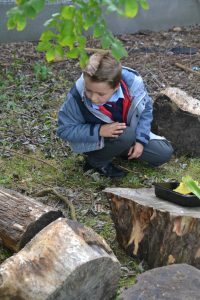 Other exciting thing happened as the children noticed that the nesting materials had a lot of interesting creatures living in them. 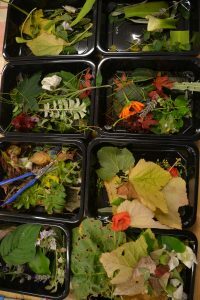 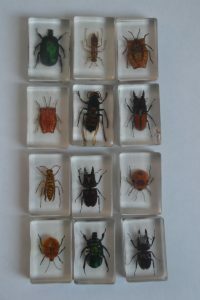 We had containers ready to collect insects so we could examine them, keep them safe and return them to the wild when we were finished. 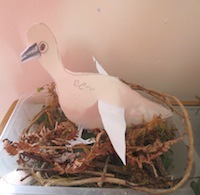 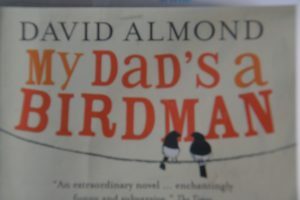 The following week we decided that we needed bird for the nests. 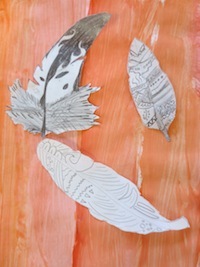 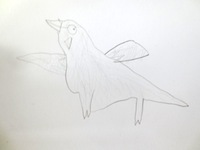 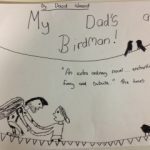 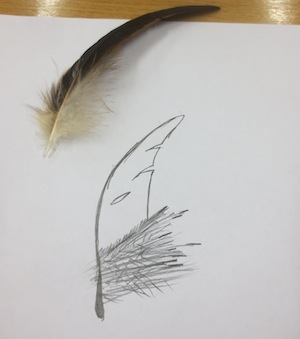 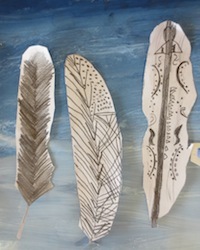 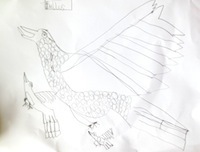 We had a look of photographs of birds that we saw in the school yard and the children made some drawings. 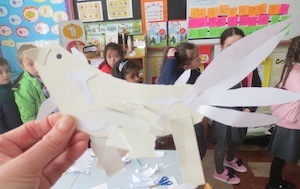 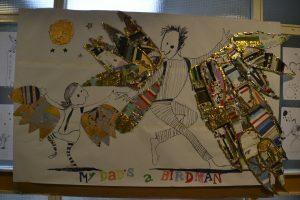 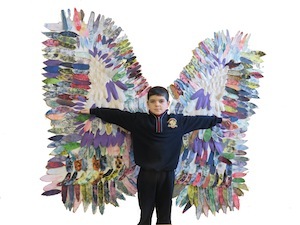 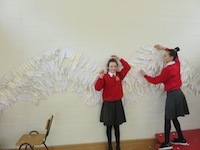 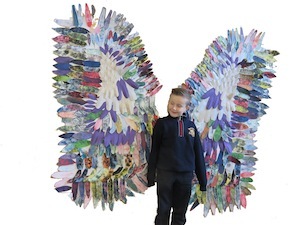 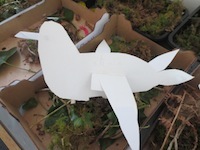 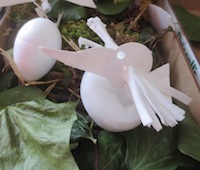 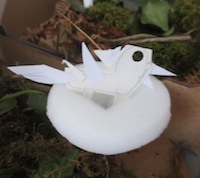 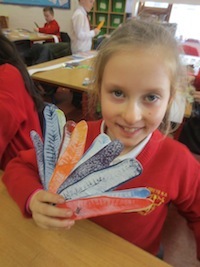 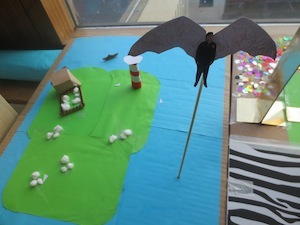 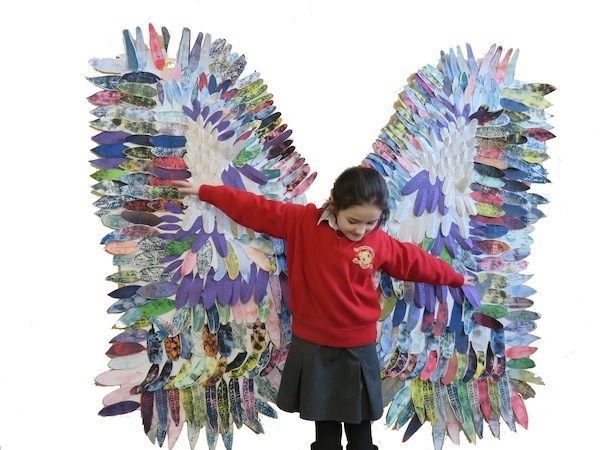 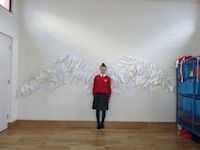 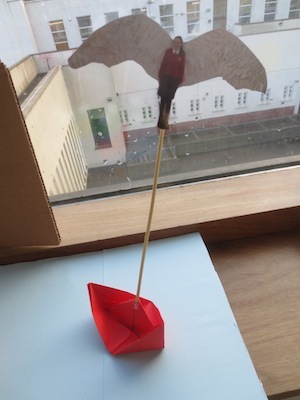 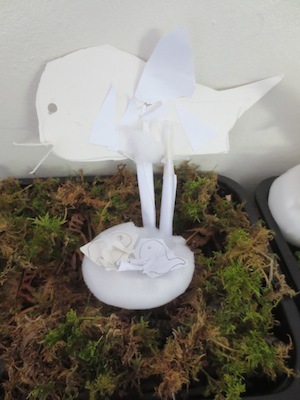 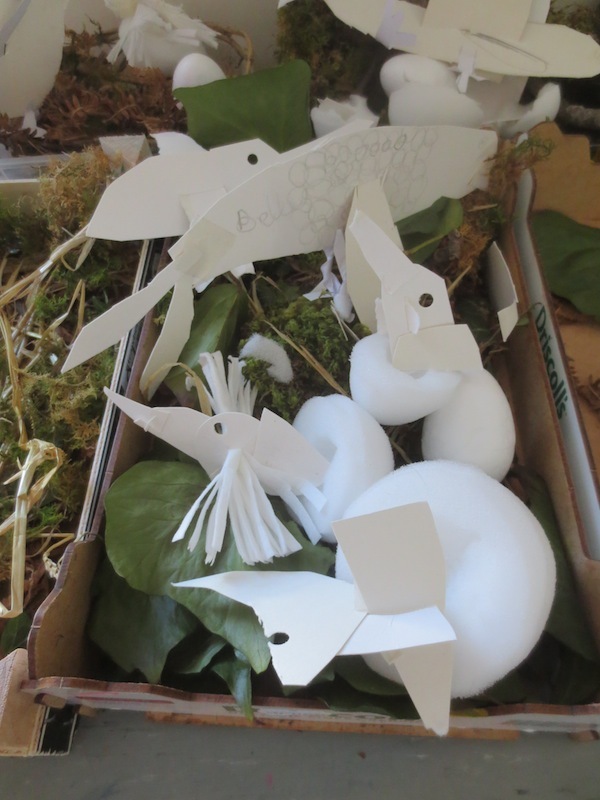 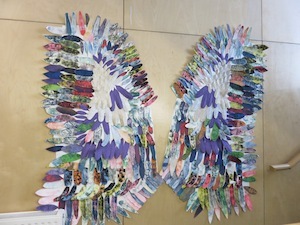 The children were given paper and card to make the birds. 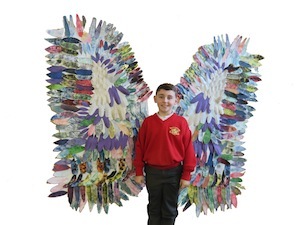 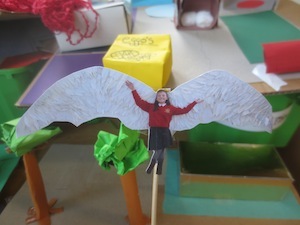 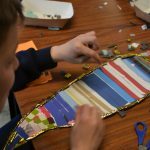 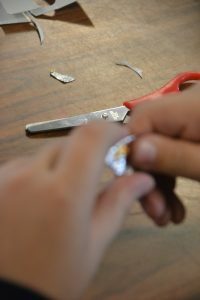 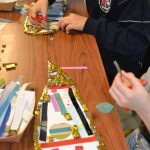 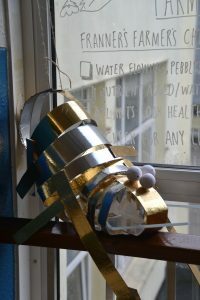 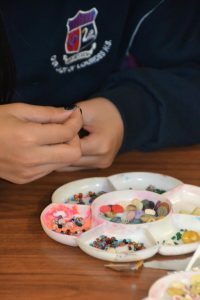 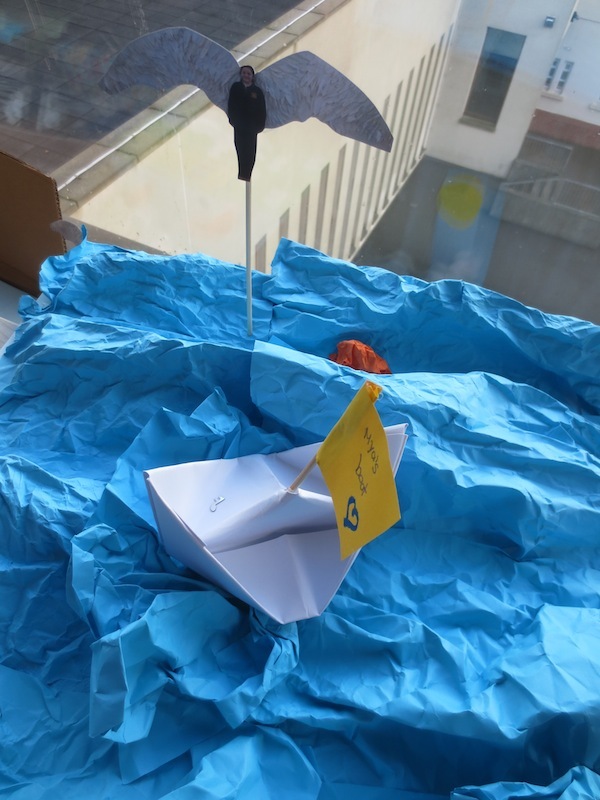 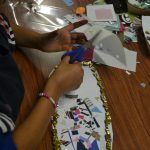 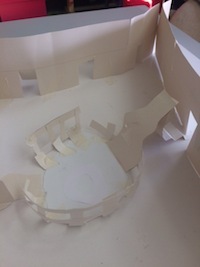 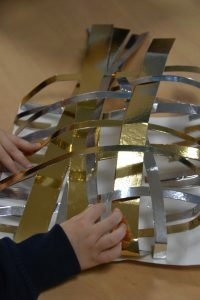 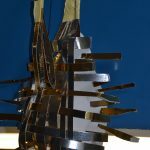 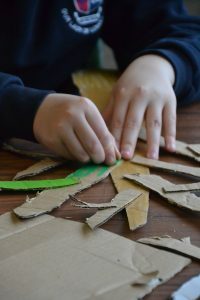 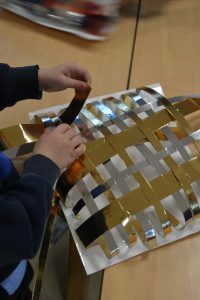 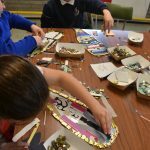 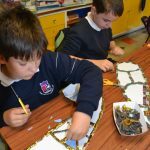 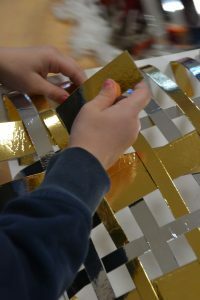 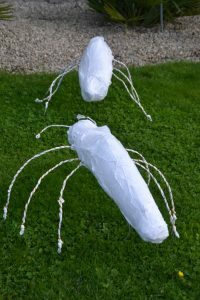 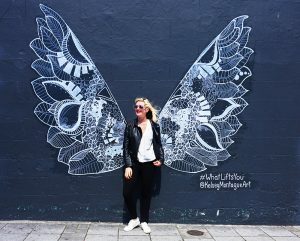 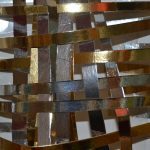 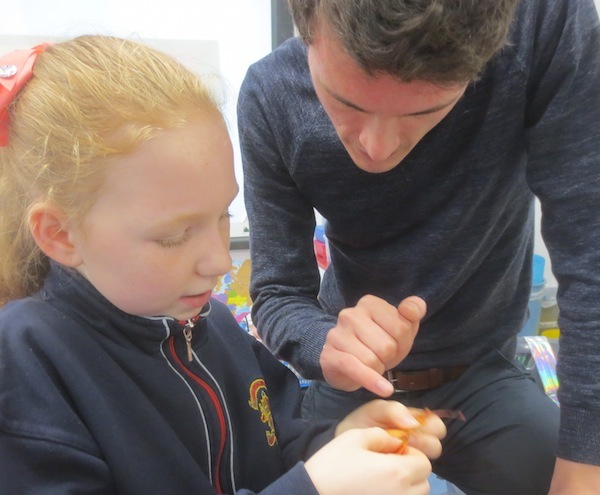 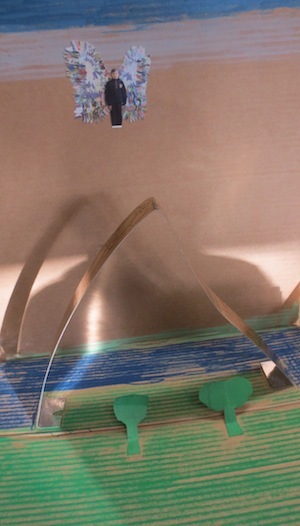 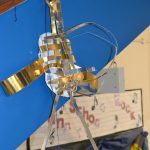 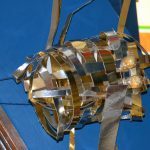 Although they were very adept at using these materials they were hesitant about making to a design, however through trial and error and learning from each other they built up confidence. 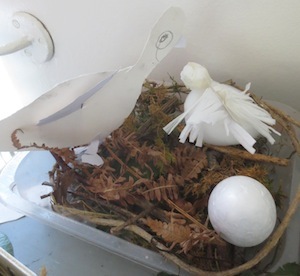 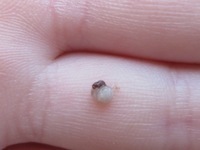 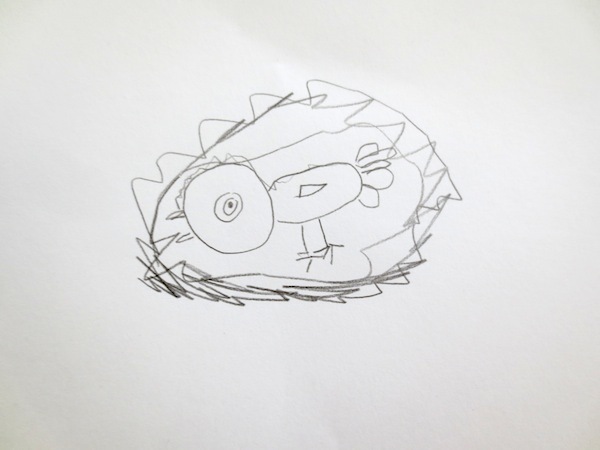 The next week we looked at eggs, chicks hatching and chicks. 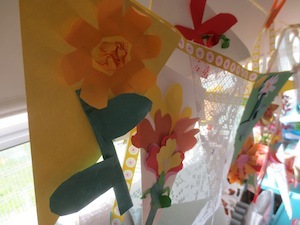 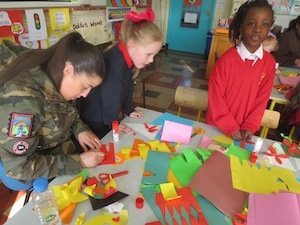 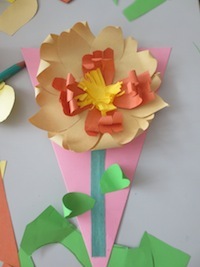 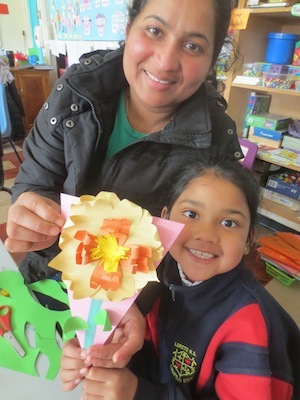 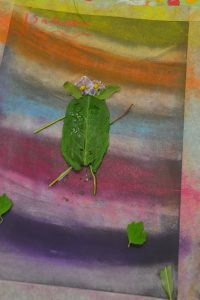 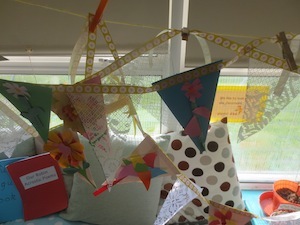 Parents were invited to join the children in making Spring flower bunting. 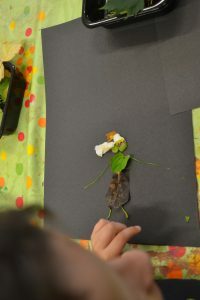 They first saw a slideshow and exhibition of all the work the children made over the past 6 weeks.The children taught their parents skills and techniques they would need to make their flowers. 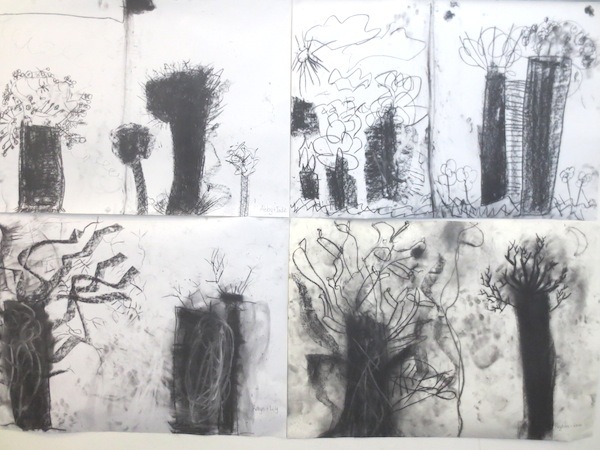 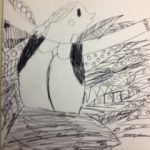 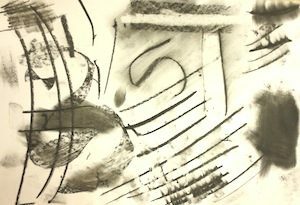 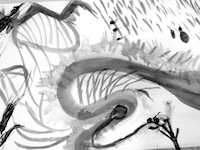 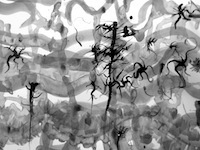 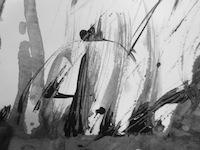 Exploring Charcoal and Ink Drawing Inspired by Chinese Art. 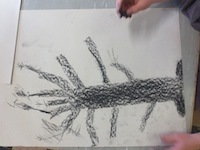 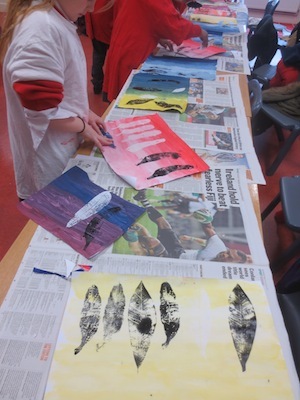 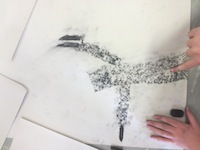 Fifth class began by exploring all the marks they could make using charcoal. 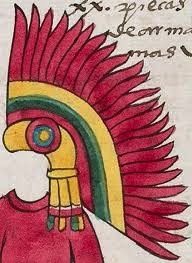 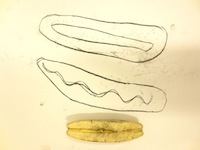 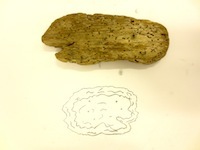 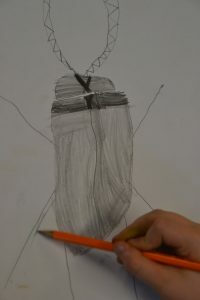 They also used fingers to smudge it and rubbers to draw into the charcoal. 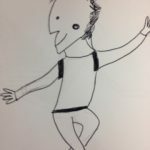 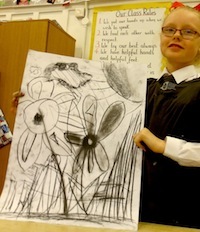 We played a game of ‘Pass the Drawing’ where each person adds to a drawing and then passes it on. 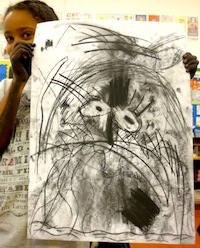 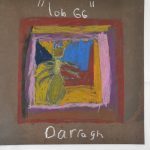 This encouraged the children to find images in the marks. 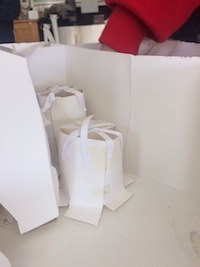 Each child got an object in a bag so they couldn’t see it. 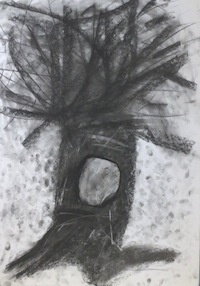 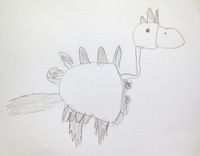 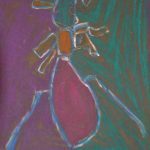 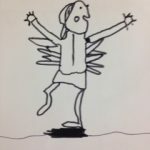 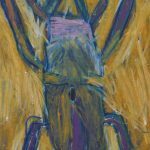 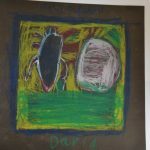 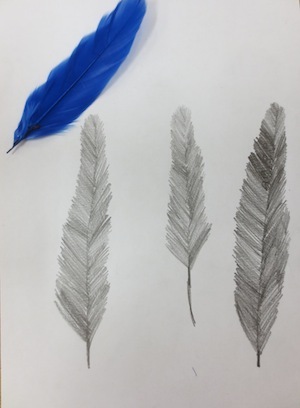 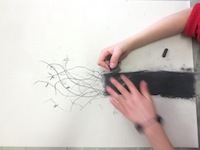 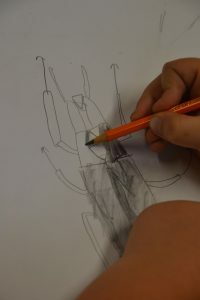 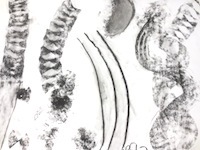 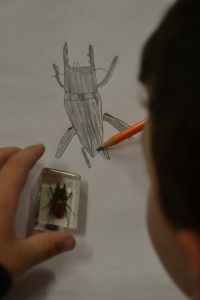 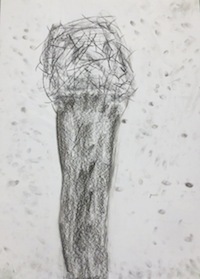 They felt the object with one hand while drawing what they could feel in charcoal with the other hand.They were very surprised how good the drawings were when they looked at their objects. 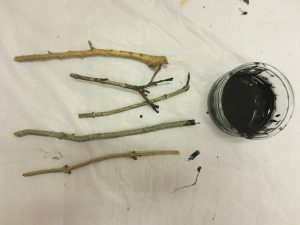 The children used water and watered down black paint individually. 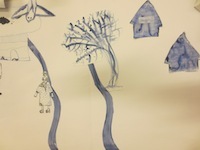 Then they painted a long scroll together. 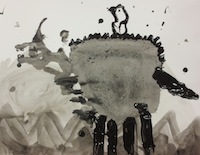 The following week when the ink was dry they used sticks and black paint to draw over their individual drawings and the scroll. 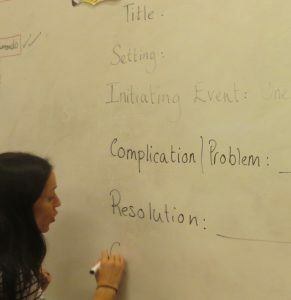 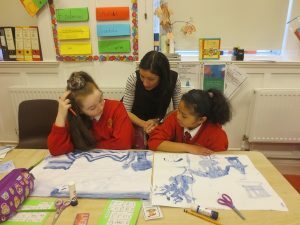 The children were studying the Willow Pattern story with their teacher. 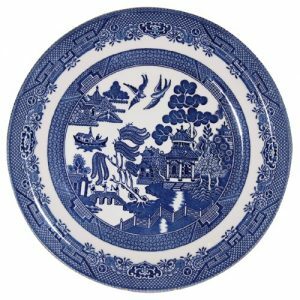 We visited the Chester Beatty Library to look at some of the blue and white ceramic vases from China that inspired the ceramic artists in the potteries in Sheffield. 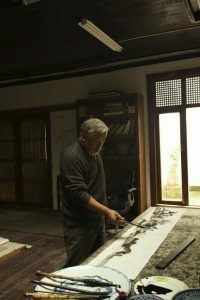 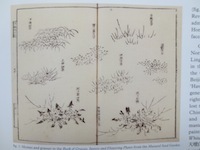 We also looked at the paintings and drawings by the Chinese artist Hong Ling in the Chester Beatty Library. 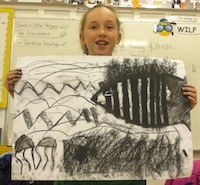 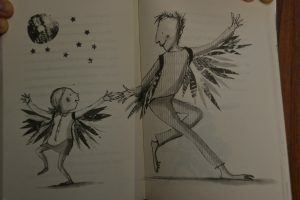 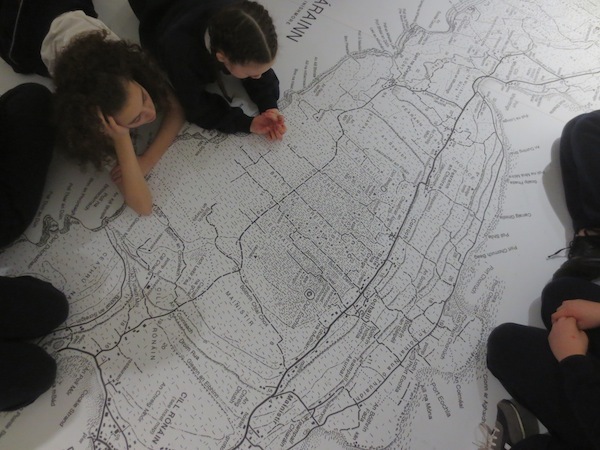 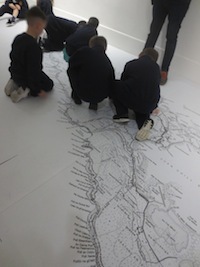 The children were very interested in the ink drawings having used this medium themselves. 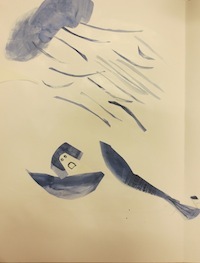 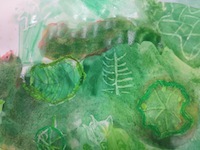 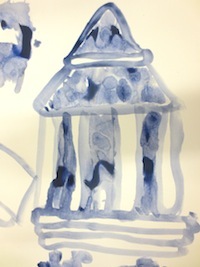 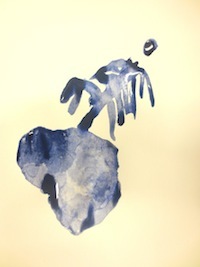 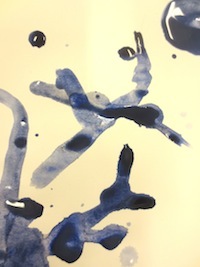 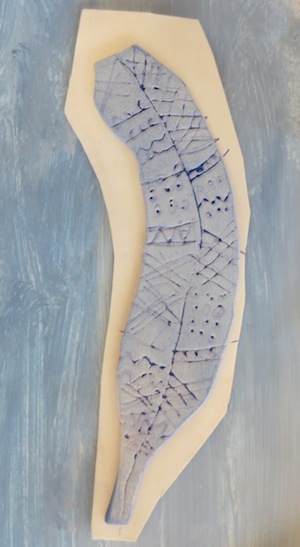 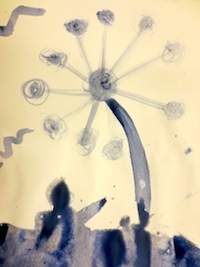 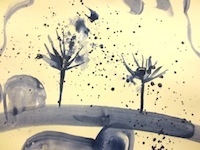 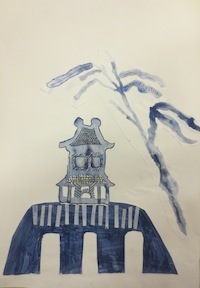 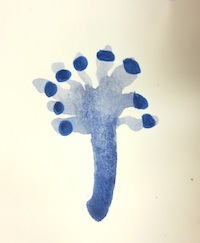 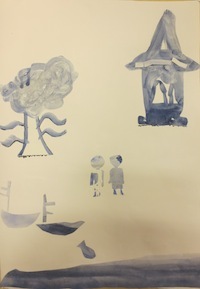 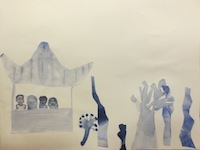 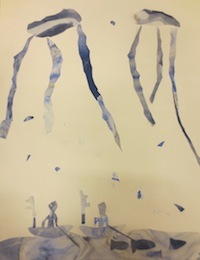 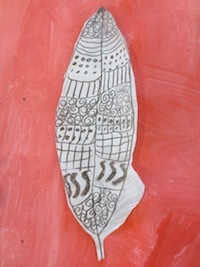 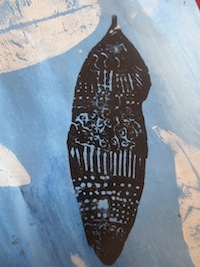 Using watered down blue paint the children made ink like drawings inspire by the Willow pattern. 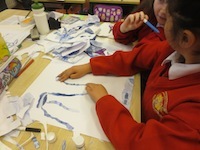 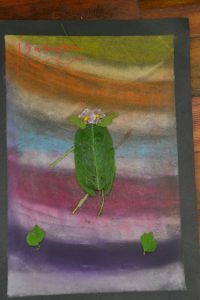 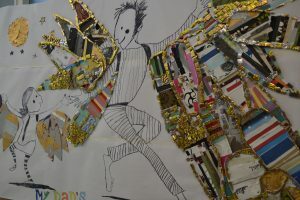 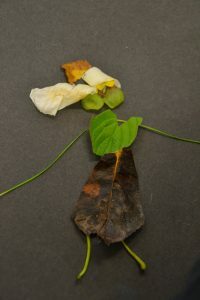 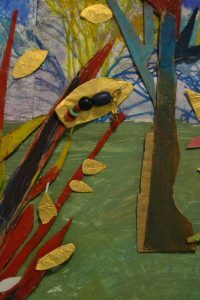 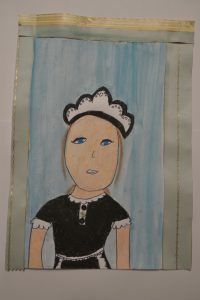 The following weeks when these images were dry they worked in pairs to create their own stories and create books. 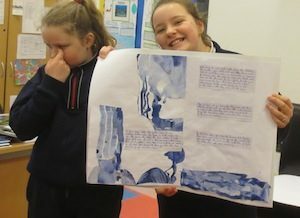 They collaged their images from the previous week into their books and added detail and pattern using blue markers. 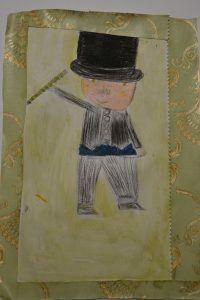 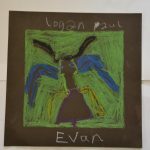 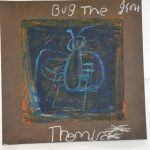 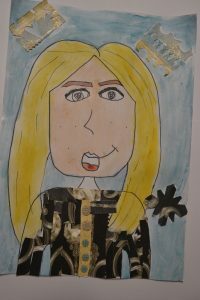 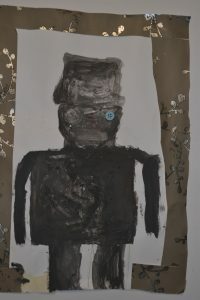 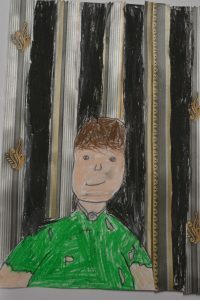 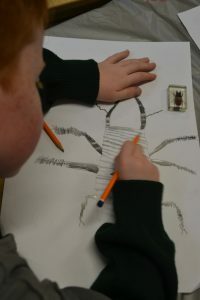 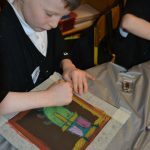 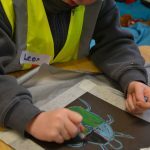 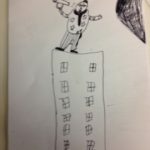 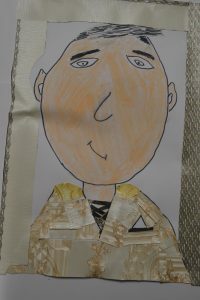 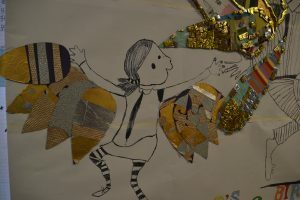 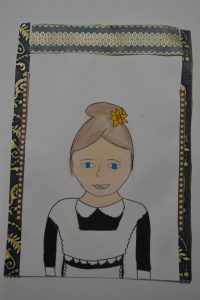 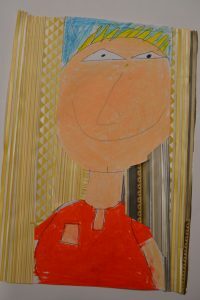 Making their initial drawings in black marker, the children then used patterned wall papers and oil pastel to their drawings of their favourite character. 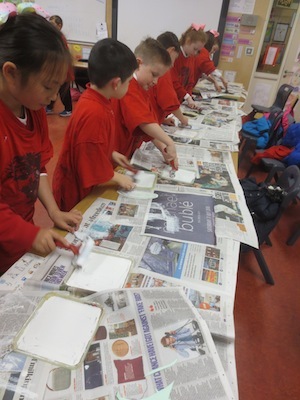 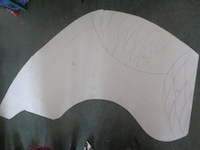 we began by rolling out large lengths of paper. 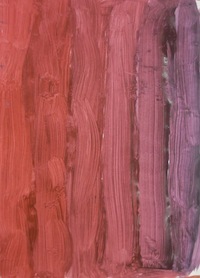 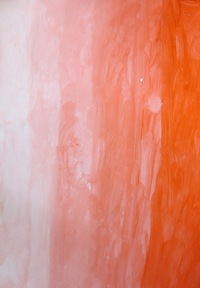 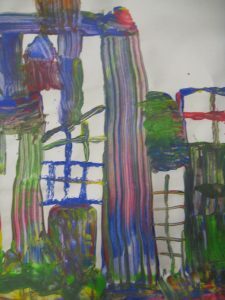 the paints were squeezed in layers at the bottom of the paper. 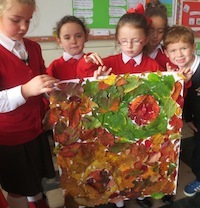 the children used squares of heavy card to scrape the paint up the page. 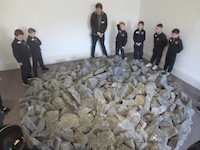 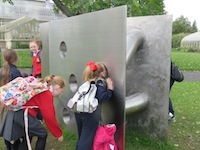 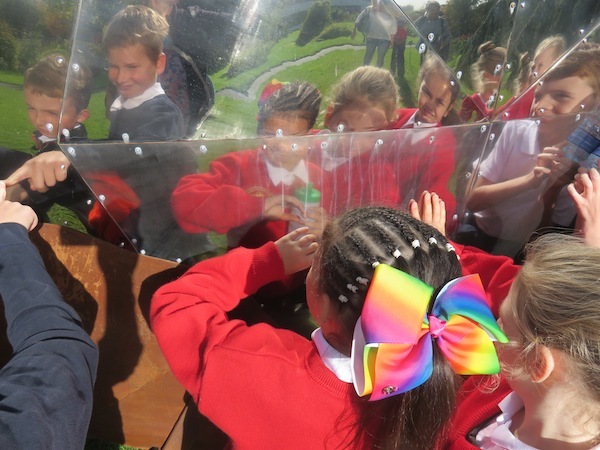 This was an exhilarating experience for the children. 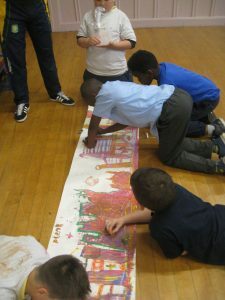 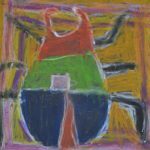 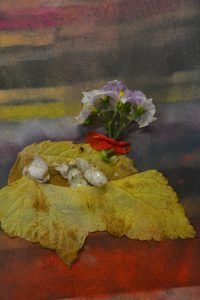 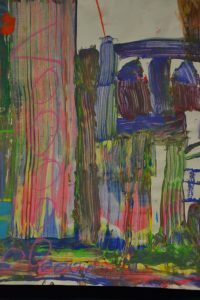 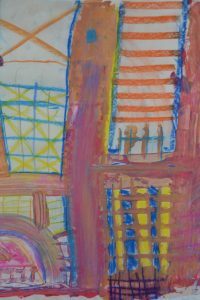 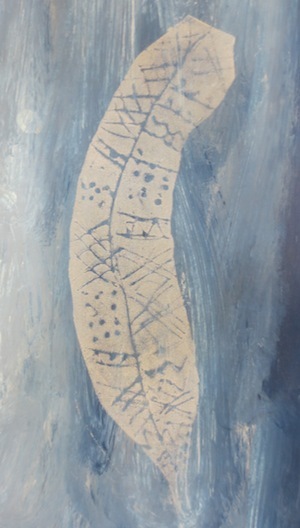 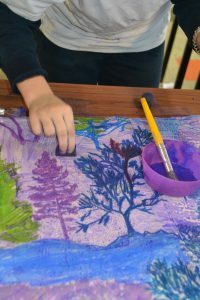 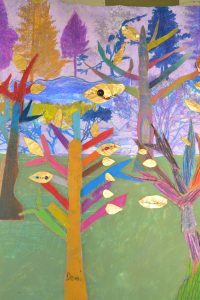 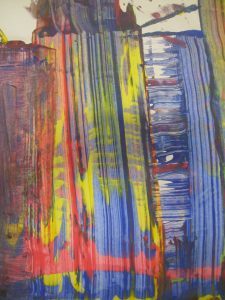 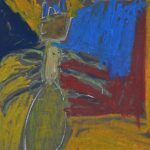 paint brushes were not allowed for this painting session so they had to explore many possibilities of making their mark. 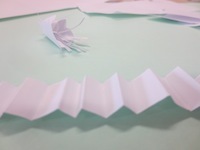 they used smaller pieces of card to create bridges and pattern. 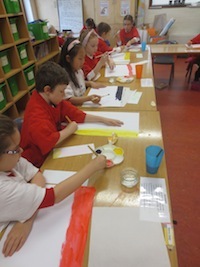 once the paint was dry they added more detail with chalk pastels. 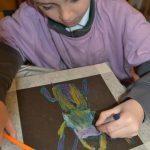 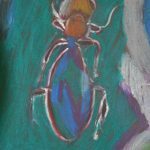 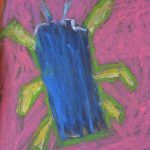 Reworking the painting using the chalk pastels added a whole new dimension to the finished work. 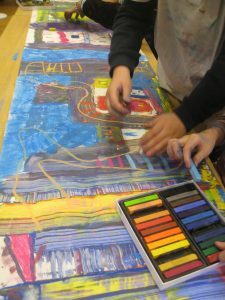 Together they created the most wonderful and interesting cityscape.